Or perhaps, I should say Hazel is. She’s been spotted in DeviantArt! 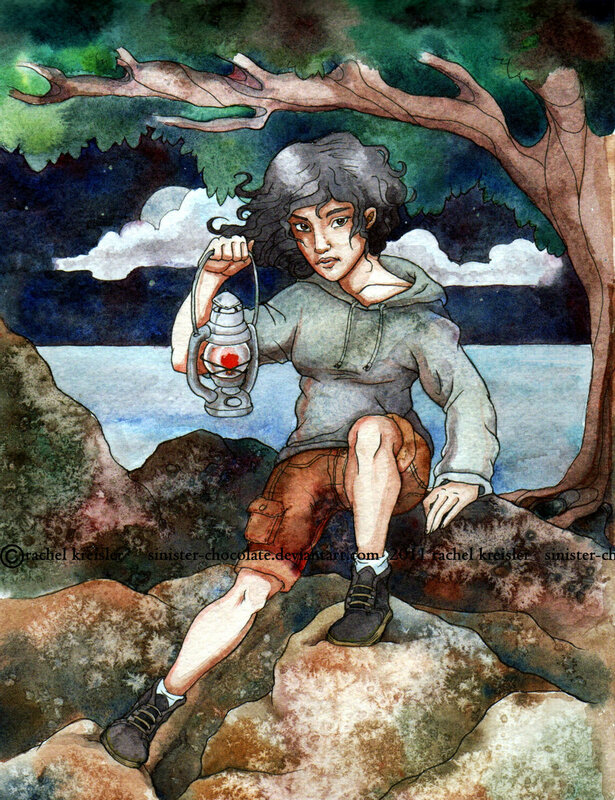 Hazel Moran, from C.E. 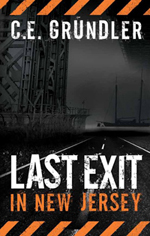 Grundler’s thriller novel, Last Exit in New Jersey. She is out and about, running into trouble, as usual. This is where she runs into a certain troubled yet endearing young man. But I won’t say more, just go read it! Fan art! Real, genuine fan art! This makes me so happy, and I love how this evocative illustration captures Hazel’s expression and attitude so perfectly. Thank you, Sinister-Chocolate, for this wonderful compliment! The last few days have been quite a ride, to say the least! 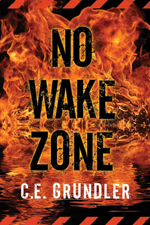 It all started on Wednesday when I was featured as the book of the day in ‘Ereader News.com’… and I discovered the description on my sales page was all chopped up. I immediately phoned Amazon, who could offer no clue as to what happened, but assured me it would be fixed in three to five days. Fortunately, even with the messed up description, sales were cooking along at an all-time high. Then came Friday morning, when the flow of sales turned into a torrent. It turns out Last Exit is one of six books Amazon included in a promotional mailer for $.99 Kindle mysteries and thrillers. It was incredible, even with the description still broken apart books were selling at an amazing rate. By days end I’d climbed the ranks clear up to #27 in the Amazon best-sellers list! Strange what you can find on the interwebs! Play great indeed! And on that note, I’m off to work on the boat! Recently I’ve had various concerned friends inform me the mesquite-smoked, charcoal-fueled grilled dinners I’ve been cooking are BAD for me. On the other hand, I’m willing to bet the grill of an accelerating SUV driven by a distracted driver looking the opposite way as he blew through a stop sign while making a right directly into the crosswalk I was midway across, causing me to dive for the curb like a terrified squirrel, has more potential to be terminal than barbequed ribs. And if, in the end, I had found myself beneath the wheels of that high-velocity land-barge, at least I’d go knowing I’d enjoyed my last supper. I’ve said it before and I’ll say it again. You can spend your life eating sticks and berries only to have a bus jump the curb and take you out. Careless drivers scare me way more than cheeseburgers. So enjoy life in moderation. You never know when your number will be up. And I can tell you one thing… tonight’s barbeque is going to taste extra good! On that note, I bring you some large, high-velocity vehicles being driven in a more attentive manner. This amuses me every time I watch, but you should know I have a black sense of humor. If you haven’t figured out from previous posts, I collect old postcards and vintage boat advertisements. 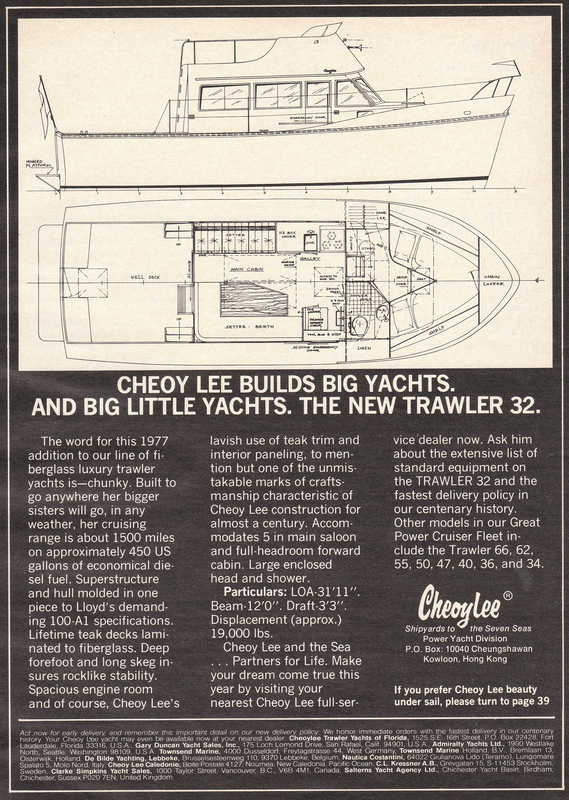 Oddly, I’ve found it easier to track down ads dating from the twenties clear through to the fifties for Wheeler Yachts, yet it took ages to find this lone ad for a 1977 Cheoy Lee 32′ trawler. But considering only a handful of these ‘chunky’ (yes, that was the very word I used the first time I saw Annabel Lee, and it turns out to be the very same word the shipyards chose for their ads,) boats were ever built, I suppose it makes sense. Click on the image, and then click on what opens, and you can read all the fascinating fine print. Annabel Lee is actually progressing at such a rate that I’ve been too busy to properly document the mayhem. 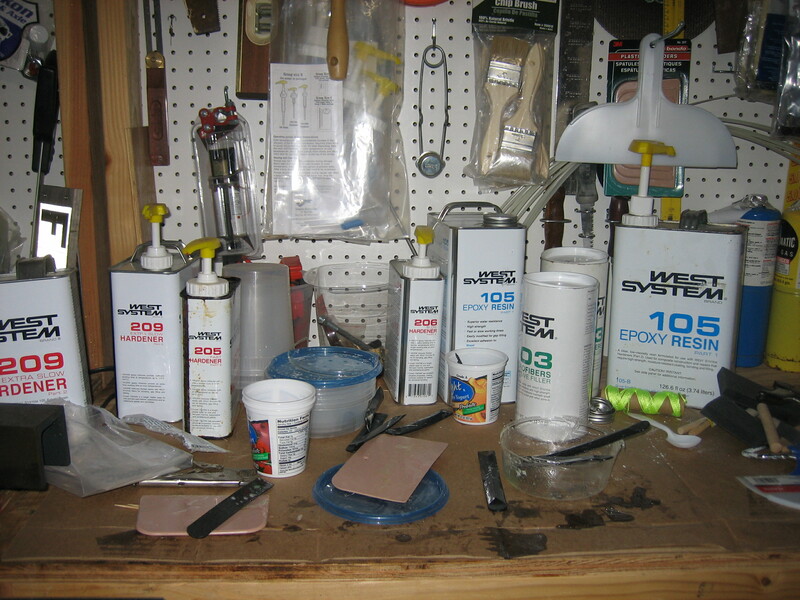 I have been taking pictures, and when the epoxy cures and the dust settles I’ll take some time to post it all. Meanwhile, I’ve been writing like mad and I’m quite pleased with the resulting murder and mayhem. While some writers may turn to alcohol for inspiration, my muses appear to be fueled by resin fumes and the fragrance of sawdust. Seems fitting, I’d say. Intelligent positive exposure makes me happy.